First a story about how I invented this framing technique. Yes, I invented it. For once I didn't steal any one else's ideas. My massage therapist offered to give me three free massages in exchange for 3 insulated window panels for the night time. It gets cold here in Maine! She wanted them out of Styrofoam and covered in pretty fabric. I custom dyed some fabric to coordinate with her room. 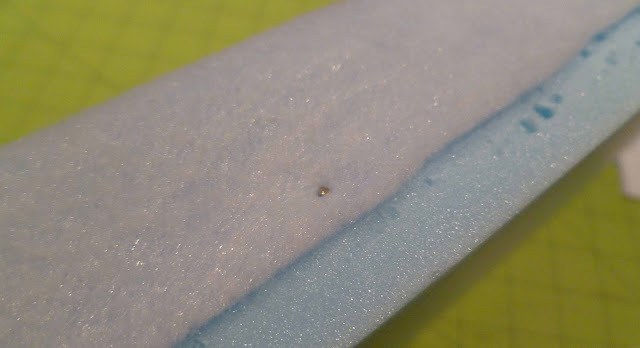 I was scratching my head trying to think of a way to attach fabric to Styrofoam and I suddenly thought of straight pins. I upholstered the panels like wrapping a package and used straight pins in the place of "tape". It wasn't until much later that I thought of using this method to frame my art work. This is the first piece I used this method and it wasn't quilted. I used inexpensive acrylic felt under the fabric for padding and to block the color of the Styrofoam. 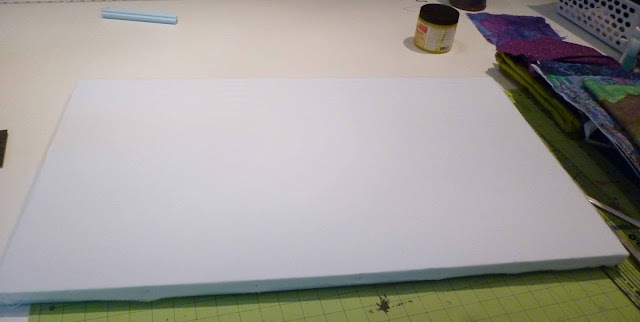 If you use this method on a quilted piece you can skip the felt layer on the Styrofoam. 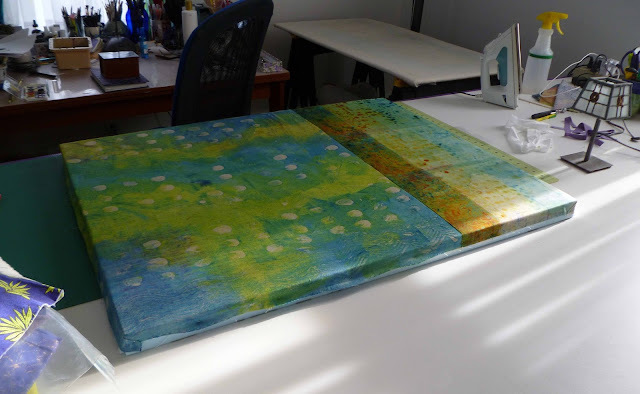 Using this method eliminates a lot of the weight on large pieces and if they were framed with glass you would have to contend with glare as well as additional weight. The Blue piece above weighted less than 5 lbs and was 48" X 48". 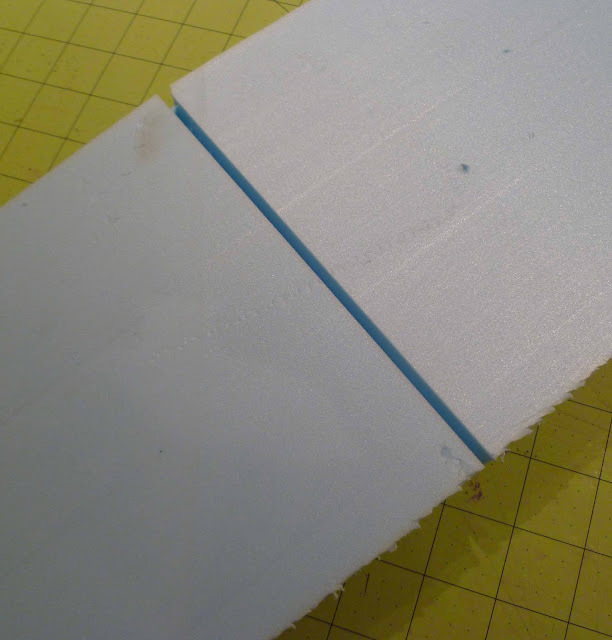 I use 1.5" thick Styrofoam and cut it to the size I want the piece to be. 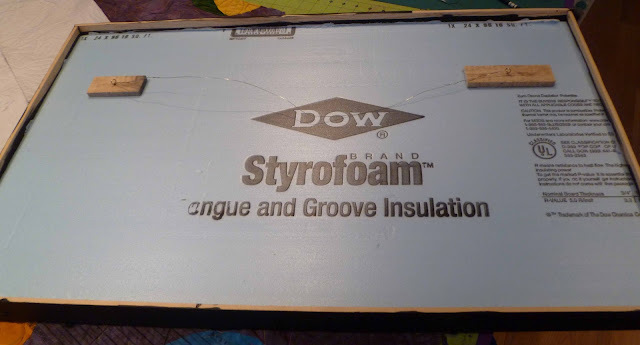 I need to allow for at least a half inch to one inch amount of fabric to wrap around the sides of the Styrofoam panel. 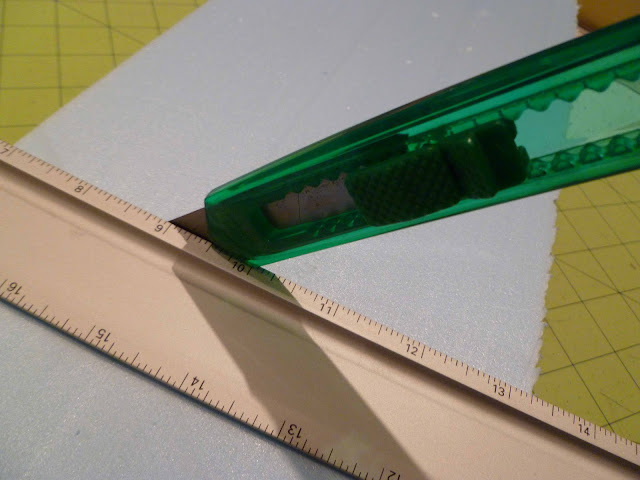 I use a disposable razor cutter and a straight edge like this aluminum ruler to score half way into the Styrofoam. 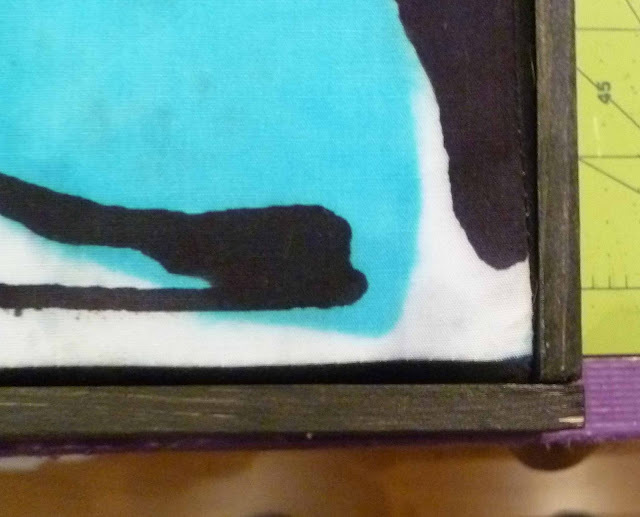 Slide the panel over the edge of the table and snap off the waste part. It cracks into a straight cut magically. I use these kind of straight pins . They are the same ones I used in the olden days (1960's). 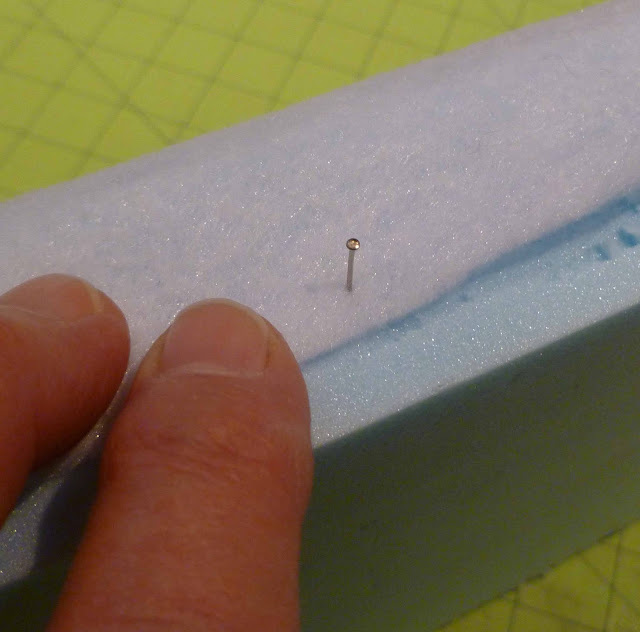 It may seem like an easy task to push a thin pin into Styrofoam but you can experience resistance. I keep a thimble handy. 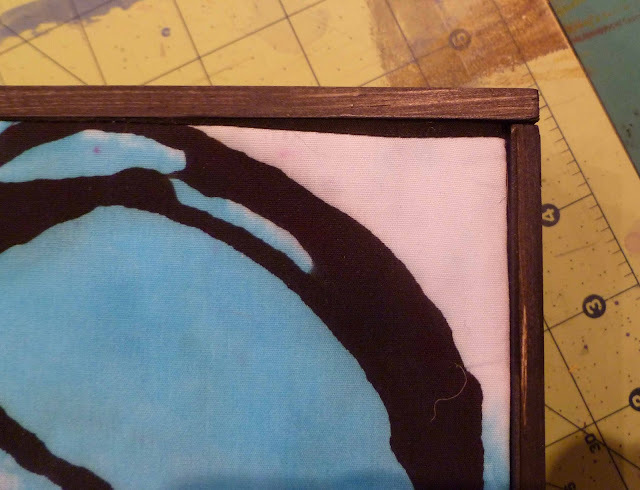 With BOTH the felt lining and your finished piece, start pinning in the middle and move to each side. Smooth the felt. 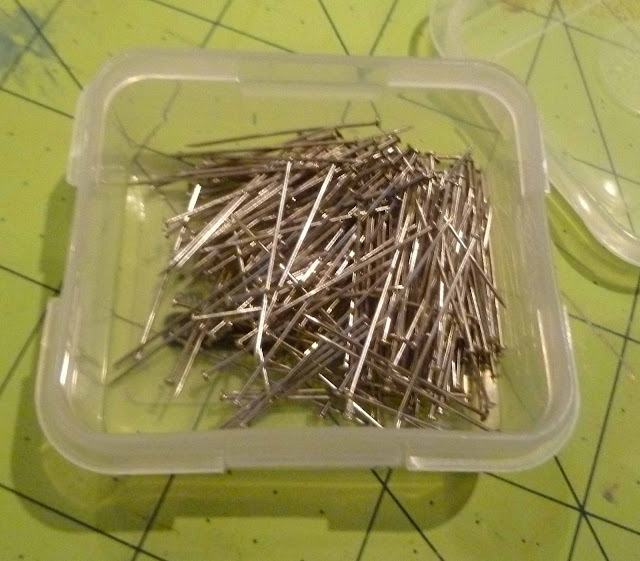 After pinning both sides, pin the top and bottom. When applying the fabric after the felt pin in the same way but put some tension on the fabric so it doesn't look baggy. Make sure you come at LEAST a half inch over each side. An inch is better. The frame isn't that tight and you don't want to have Styrofoam exposed. Prop up your pinned piece and make sure it is the way you want it. After adhering the frame there is no going back. Next cut two strips of thin wood to exact length of each side. I use 1.5" finished wood moulding from the lumber yard. It looks like very pretty smooth yard stick wood. You can also use lath which is very rough for pieces 48" or smaller if you like that look. Either way paint or poly all the wood, letting it dry over night before cutting to length. 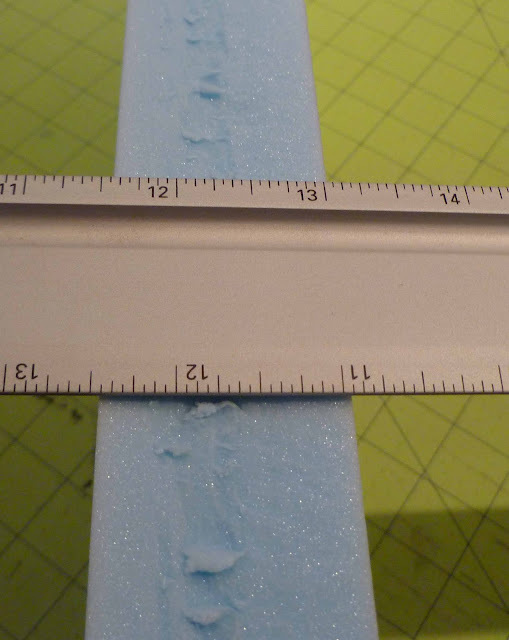 I apply three "pinkie" size pieces of Styrofoam adhesive to the edge of the piece where the Styrofoam is exposed. I use PL300. This is especially formulated for Styrofoam as other adhesives can actually melt the Styrofoam. I place the first two wooden strips of moulding cut to size to the sides on the piece making sure the front edges of the wood are flush with the face of the piece. As you press the wooden frame pieces onto the sides with a conservative amount of adhesive, hold in place and screw the slates in place with a 1.5" dry wall screw. DON'T over tighten. 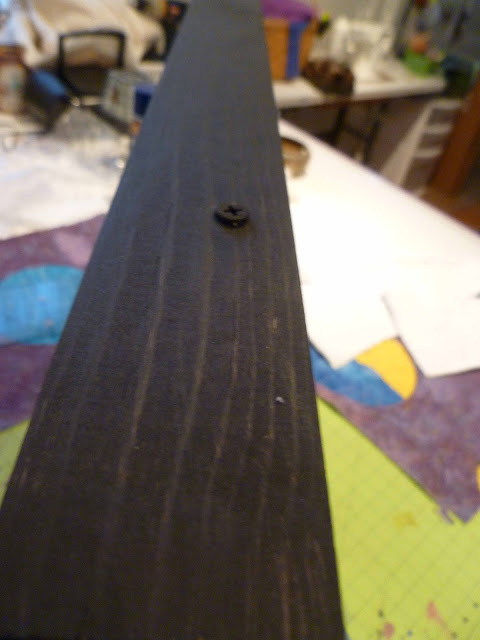 Allow the screws to hold the wood in place while the adhesive dries, about 2 hours. I let it sit over night to make sure. 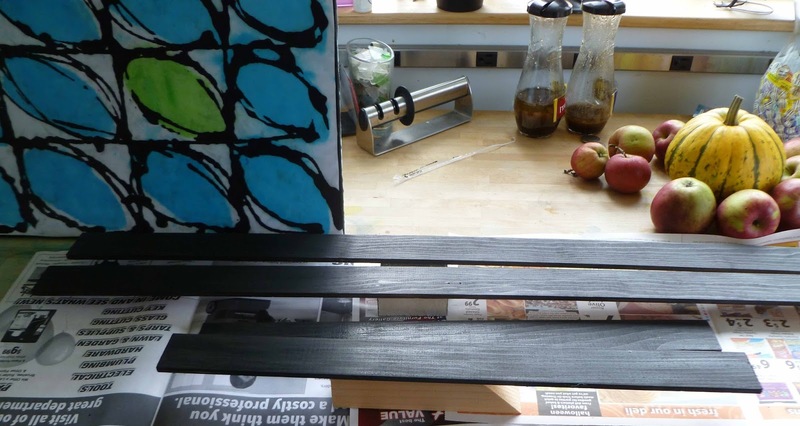 Next take a length of painted or polyed wood and lay it on top of the piece as though you were using it like a yard stick, making a pencil line to mark the length. Measure the bottom. If the pieces are different lengths, label them. Next glue and screw the top and bottom pieces keeping the edges flush to the front. 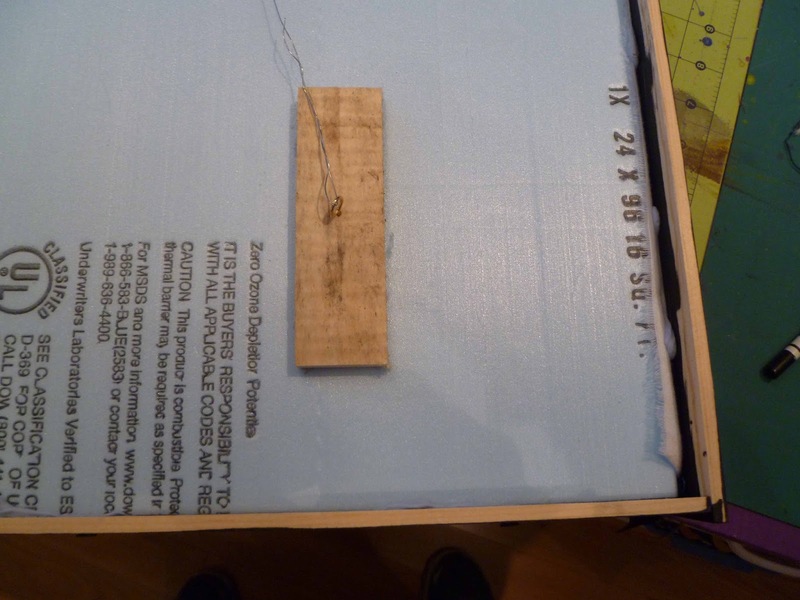 Lay the piece face down on a clean surface and adhere two scraps of wood to the back for hangers. Next day you can can screw in eyelets and attach a wire for hanging. 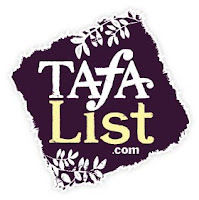 If you have any question just leave a comment or use the contact form and remember, I need your email adress to reply. What a great tutoral you made Beth. 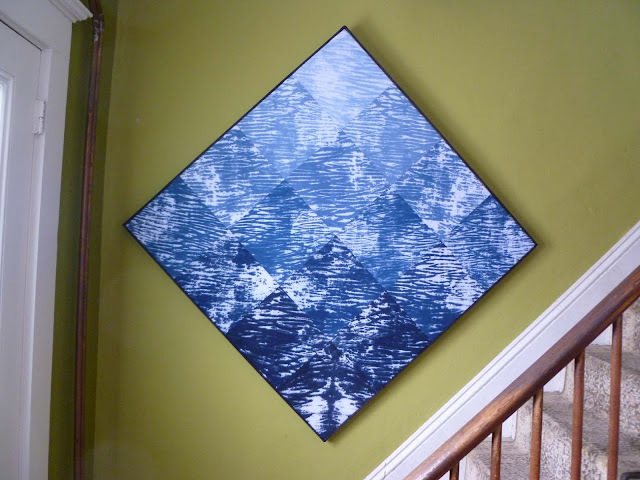 This is an nice, and I think, easy way to put your art on the wall. I like this idea. Especially for bigger pieces. This is a fantastic idea. Thanks for sharing the tutorial and making it look so easy.